When we’ve experienced loss or damage to our teeth we can’t help but notice the impact it has on our smile and confidence. In the past, it’s been necessary to replace these teeth with partial dentures or to simply suffer the loss of the tooth. Innovations in dentistry have provided many options for dealing with the loss of these teeth, and porcelain crowns are among the most popular solution for those looking for a long-lasting, durable, and natural looking way to replace lost or damaged teeth. Porcelain crowns are often used when a tooth is damaged beyond repair, but the tooth in question is prominently visible in the patient’s smile. By using advanced dental techniques porcelain crowns can help return the form and function of the tooth to the patient by replacing the entirety of the tooth down to the gum level. Dental crowns can be selected either for use out of necessity, or for their ability to give the wearer back their beautiful smile or even improve on it. When you have experienced the loss of the majority of your tooth, a porcelain crown is usually the go-to answer for your dentist, especially in the event of trauma or severe enamel erosion. Sometimes this is caused by people who grind their teeth to such a degree that the teeth have actually been damaged. How Are Porcelain Crowns Applied To The Teeth? Crowns and veneers have very similar application methods, it’s primarily a matter of degrees. With porcelain crowns, much more of the tooth is being replaced than with veneers. The replacement crown will be shaped and fashioned to the desired appearance, and then adhered to the remaining tooth with a special resin that hardens under a special curing light. Once applied a dental crown is effectively permanent, with only additional damage or trauma requiring it to be replaced. Are There Any Drawbacks to Porcelain Crowns? Porcelain crowns are an excellent solution for those trying to have their teeth returned to a natural, healthy appearance, but they do come with some potential drawbacks. Lab Created – Since Porcelain Crowns must be sent to a dental lab to be created, you’ll be fitted with a temporary crown until it arrives. Sensitivity – While not occurring in all patients, temperature sensitivity is a concern for some patients. If you experience this after your crown is affixed, speak to your dentist. Durable, To A Point – Porcelain crowns are incredibly durable for replacements, but they lack the flexibility of natural teeth, so certain foods may have to be avoided. Additionally, patients who grind their teeth or clench their jaws may need a mouthguard to protect their teeth. 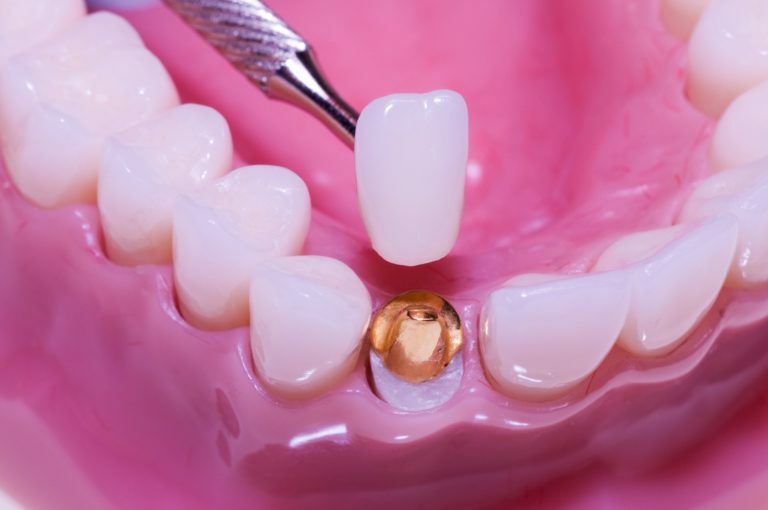 Is There Any Special Maintenance Required with Porcelain Crowns? Porcelain crowns require the same maintenance as your natural teeth, regular brushing with a non-abrasive toothpaste and a conscientious flossing habit. Initially, a few follow-up visits will be required to make sure the crown took properly, but after that, it’s largely clear sailing. If you have any concerns about your porcelain crowns contact your dentist immediately.